Children's Hospital Los Angeles provides the full spectrum of surgical care — from routine procedures to complex surgeries — in two modern, leading-edge surgical centers. Many surgery centers are not able to provide care for children who need complex operations. These types of cases are routinely treated at Children's Hospital. Our surgeons have access to all of the specialists who may be needed for a child's recovery. Post-surgery care is coordinated by a multispecialty team of pediatric experts and children can be smoothly transferred from the operating room to an inpatient setting. Play area staffed with a Child Life Specialist. Access to our gardens, dining options and waiting areas. Parents join children at the bedside as they go to sleep and awaken after surgery. 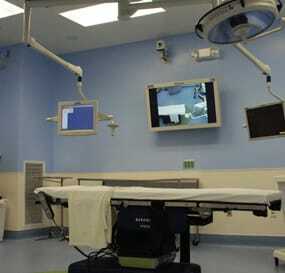 The Ambulatory Surgery Center is a modern, fully-equipped facility, featuring three state-of-the-art operating rooms and one procedure room. This center provides all of the convenience of a state-of-the-art outpatient procedure center yet provides families with access to the full array of pediatric services available at our hospital's main campus. The center is staffed by anesthesiologists and registered nurse anesthetists who are specially trained in treating children. The Center is named after one of the hospital’s most generous benefactors, contributing more than $18 million. Burton Green Bettingen, known to her friends as “Burtie,” was eight years old when she was rushed to Children’s Hospital Los Angeles for neurosurgery due to complications from meningitis, a brain condition. The compassionate care she received during her time here made an impact on her long after she went home.